Outside of the Town Hall theater on West 43rd Street in Manhattan, a crowd of smiling and optimistic people Friday overflowed into the one-way street. Delivery trucks and yellow taxi cabs creeped by, their engines engaged in a shouting match with Bennet Weiss, a man who bore a fleeting resemblance to the Democratic presidential candidate they were all there to support. "We don't have billions of dollars! All we have are people wearing Bernie pins," Weiss yelled, a large black umbrella covered in Bernie Sanders campaign pins at his feet, catching drops of sweat from his brow. The Occupy Wall Street protester-turned-Sanders supporter urged the crowd to wear the pins at all times with no exception -- even in the shower -- and gave them away freely to anyone who said they didn't have enough cash to afford to pay the suggested donation. 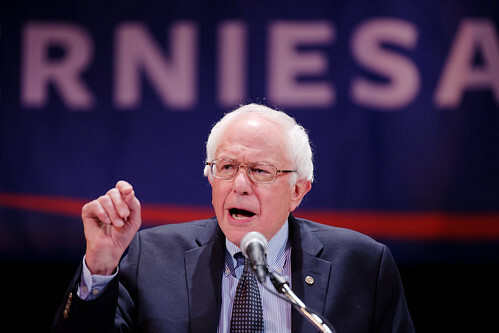 That's the kind of populist support Sanders' campaign has steadily been attracting since the U.S. senator from Vermont formally announced his candidacy in late April. Friday was no exception, with passion-filled people who think Sanders has proved himself the worthy champion of causes they care about the most, such as income inequality, climate change, Wall Street reform and further healthcare reforms. But, perhaps most importantly, they also think he can win the White House. "Absolutely" he can win, said Joe Trinolone, 30, a former finance industry worker from Long Island, New York, who is studying mathematics at St. Joseph's University. "I mean, he's winning right now." Sanders, during a fundraising speech Friday, ticked through the policies he cares about and areas of change he wants to see in Washington should he become president. At each turn, his blend of outrage, optimism and sly sarcasm brought raucous cheers from the crowd of 1,100. He rejected recent Wall Street Journal criticism of the high price tag of his proposals, including making public colleges and universities free, lowering so-called real unemployment by pumping funding into infrastructure repairs for the nation’s roads and bridges and implementing a universal healthcare system. Instead, he pointed to European nations that already have those programs. He implored the crowd to think about what many of them were already talking about: that taking on the big-money interests in the United States that impede those sorts of policy changes is a shared moral obligation. “Welcome to the revolution,” Sanders said, describing what he believes must happen to American politics. “We can accomplish all of this and more.” And the crowd ate it up. When asked why they support Sanders, many described his candidacy as a movement. They love his policies, and have a hard time thinking of much they don’t like about him. They especially like that he has been a consistent voice during his time in Washington. That’s a big perceived difference between Sanders and his Democratic rival Hillary Clinton. Those "feeling the Bern" were split on whether they would consider voting for her if she becomes the nominee. Many were newcomers to political action but felt compelled to join the fray when they heard Sanders and his message. Sanders has seen an unexpected rise in the polls since he joined the race for the Democratic nomination shortly after the current national front-runner Clinton announced her candidacy. While Sanders was trailing Clinton by 21.4 percent in national averages of polls compiled by Real Clear Politics, a look at early nominating states like Iowa and New Hampshire paints a different picture of vulnerability for Clinton and strength for Sanders. The two candidates are tied in Iowa, which constitutes a dramatic drop for Clinton and an impressive surge for Sanders, who has been distancing himself from Clinton in New Hampshire at the top of the Democratic pack since Aug. 25, when he jumped past her in the state for the first time. He currently leads there by 10.5 points. The candidates are noticeably different in many ways, from policy prescription to fundraising strategy. Clinton has moved leftward since announcing her candidacy, but she is still threatened by the populist appeal of Sanders, who has long championed the causes that seem to be coming into grace for the Democratic Party. While the candidates currently hold some very similar positions on issues such as immigration reform, gay rights, gun control and campaign finance reform, Sanders has been able to stake out positions to the left of Clinton on other issues that excite some vocal voters. Among them are his strong anti-war and anti-government surveillance positions as well as his distaste for President Barack Obama's Trans Pacific Partnership trade deal. Sanders also has been a vocal critic of Wall Street and champion of financial reforms, and his stance on those issues has drawn attention to Clinton's cozy relationship with Wall Street executives and the huge paychecks she has received for speeches to large banks since leaving the U.S. State Department. For some Sanders supporters, though, the perception that Sanders has been a consistent proponent of these liberal policies, and cares about them more than winning, is key. “It’s the message that supporting Bernie Sanders is not just voting on a horse in the race” that attracts Brian Dillon, a 28-year-old self-employed Web designer and developer for e-commerce, said Friday. Dillon has voted just one time in his life, but he has been organizing meetings to drum up support for Sanders. Sanders's fundraising portfolio also is the reverse of Clinton's. While the former secretary of state is expected to spend somewhere north of $1 billion should she win the primary and head into the general election for 2016, the same has not been said of Sanders. Currently, Clinton has raised, through her campaign committee and super PACs associated with the campaign, $47.5 million, according to data from the Center for Responsive Politics. Sanders, on the other hand, has raised just shy of $16.5 million, according to CRP data. Their most startling difference in fundraising, however, can be seen in the size of the donations they're receiving. The Clinton campaign received 82 percent of its donations from large contributors, and her top industry donors, not including retired people, so far have been lawyers, business services and the financial industry. In contrast, Sanders relies much more on small donations, which are defined as donations totaling $200 or less. So far, 69 percent of his contributions have come from small donors, and the biggest industries that have given to his campaign have been from the education, legal and healthcare sectors. Who are those small donors? The types of people who showed up Friday. Some said they donate $25 to $30 a month to Sanders. Some said they have donated several hundred dollars since he jumped into the presidential race. Nearly all of them mentioned they don't earn a ton of money personally. One in particular, Machumu Sakulira, said he donated $500 before attending Friday’s event.